The ongoing legal war between the Town of Sackville and former Heritage Board member Louis Béliveau moved to a new battlefield on Thursday — the New Brunswick Court of Appeal in Fredericton. Béliveau asked a panel of three judges to overturn a lower court decision upholding his dismissal from the Sackville Heritage Board in January 2016. He also asked the judges to rescind the $11,447.46 he has been ordered to pay by a lower court judge. The legal bill includes $9,000 to cover the town’s court costs and $2,447.46, mainly for its photocopying fees. It became clear yesterday to those listening in the courtroom that the case of Béliveau vs. Town of Sackville hinges on a few key questions. For example, was Sackville Town Council within its rights to remove Béliveau from his volunteer position on the Heritage Board and did councillors act reasonably when they did so? 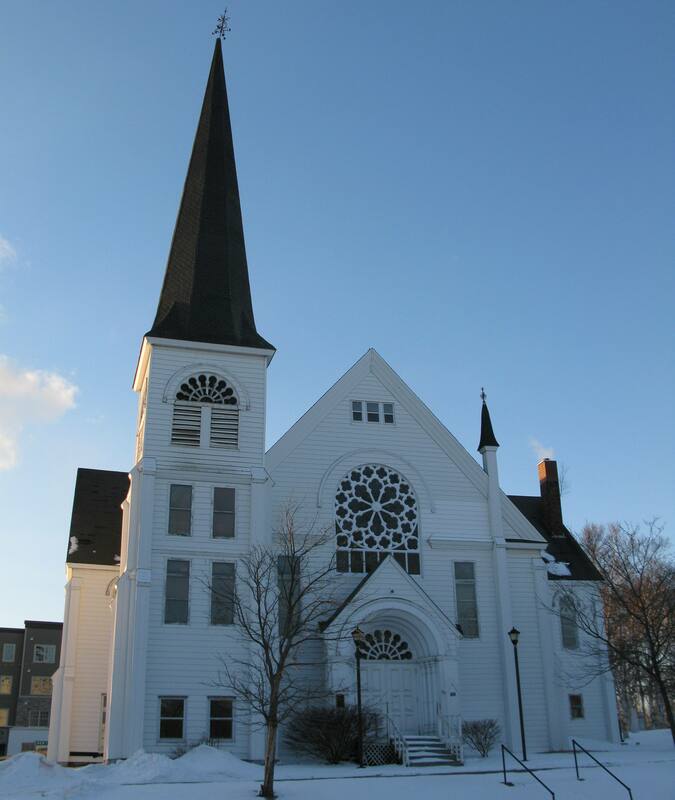 It’s clear from documents filed with the court that demolition of the Sackville United Church caused painful splits within the community. The Heritage Board’s decision to issue a demolition permit in March 2015 came after several months of tension, soul-searching and controversy during which some board members resigned. In April and June 2015, six remaining board members, including Louis Béliveau, wrote two letters to Town Council complaining, among other things, of “blatant interference” in their work by the mayor, councillors and town staff. Town Council responded by recruiting Moncton lawyer Kathleen Lordon to investigate what happened and to make recommendations for avoiding similar situations in the future. The contents of Lordon’s $47,000 report are secret. Lawyer George Cooper, who spoke for the town at yesterday’s hearing, said the document must remain confidential to protect the privacy rights of the many people who were interviewed for it. But, although the document itself is not available, Louis Béliveau, George Cooper and the three judges discussed one of its key findings that is a crucial part of this case. According to their comments, it appears Lordon found that Béliveau should not have testified when SPLASH, the local group trying to save the church, unsuccessfully appealed the demolition permit to New Brunswick’s Assessment and Planning Appeal Board (APAB). It was suggested in court that Lordon found Béliveau, who is a practising lawyer, guilty of professional misconduct for testifying before the APAB about the Heritage Board’s decision to issue the demolition permit — a decision Béliveau himself had approved. Lawyer George Cooper told the judges that while members of SPLASH were entitled to appeal the demolition permit, Béliveau should not have given testimony supporting their appeal. “He took off his referee’s shirt and put on a team jersey,” Cooper said. All three judges seemed surprised not only that Béliveau himself would have testified before the APAB, but that the town lawyer was also planning to put Ron Corbett on the stand. One of them, Mr. Justice Marc Richard called it a “bizarre situation” akin to a judge from a lower court testifying about one of his decisions at a higher appeals court. In the end, George Cooper argued that Sackville Town Council was within its rights to remove Béliveau from the Heritage Board based on Lordon’s finding that he was guilty of professional misconduct. Béliveau calls the town’s action unreasonable adding he alone was singled out for punishment while there were no sanctions against others named in the Lordon report. Béliveau also says it’s unfair that he’s on the hook for thousands of dollars in court costs for challenging the town’s decision to remove him. At the conclusion of yesterday’s hearing, Mr. Justice Richard said the court would issue a written decision at a later date. This entry was posted in Federal Election, Town of Sackville and tagged George Cooper, Judge Marc Richard, Kathleen Lordon, Louis Béliveau, Ron Corbett, Sackville United Church. Bookmark the permalink. Thank you for this report for those of us who could not make it to Fredericton.